… a non-fiction book that has become the leading source of factual information about the famous chapel in Orkney. The story of Orkney’s Italian chapel is one of the most inspiring of the Second World War. Around 1,200 Italian prisoners of war, captured during the North African campaign, were brought to Orkney to help build the Churchill Barriers. It was the greatest engineering feat of the war and one that many people said could not be accomplished. The men were split between two camps. Those in Camp 60, on the tiny island of Lamb Holm, created a beautiful chapel that would become known around the world. The building is a masterpiece, an extraordinary example of skill, determination and dedication – a lasting reminder of the true strength of the human spirit and what can be achieved during times of great adversity. ‘I thought the book was an excellent piece of research which shed new light on one of Orkney’s great treasures.’ Magnus Linklater, The Times. ‘Having spent three years researching the events surrounding the chapel’s creation, I had discovered and amassed a huge amount of fascinating background material, much of which was unknown even to those who were closely connected to the chapel. This material included a large number of photographs that had not previously been generally available. 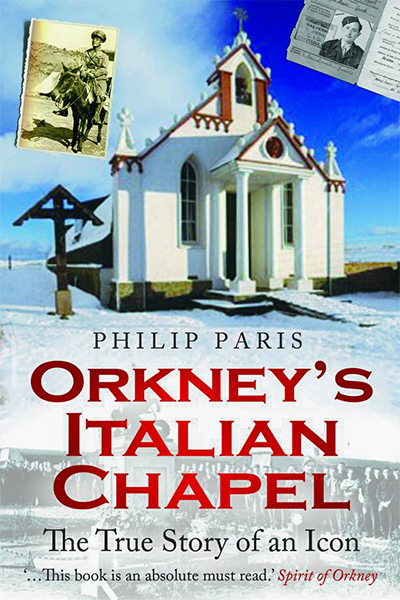 Orkney’s Italian Chapel: The True Story of an Icon (2010) was published initially in hardback by Black & White Publishing. The paperback version (£11.99) – ISBN: 978-1845025298 – is available from any high street bookshop, while the paperback/ebook can be ordered from Amazon.